”Who’s this?” the woman on the other end of the phone asks back. As I talk, I glance around looking for any sign of Linda. Nothing. Nothing at all. Suddenly, it occurs to me that she had probably hit the ladies’ room and dropped her cell phone on her way there. ”Go check. Now!’ You have to find her before that nutcase from Facebook does!” the voice on the other end of the phone urged me. The urgency on her voice gets me extremely worried. I run to the restaurant restroom as fast as I can. I call Linda’s name and tap on the unlocked door which swings open at my touch. I find Linda lying on the floor, her dress ripped off, with a bullet hole right between her eyes. I want to scream but no sound comes out. The nutcase from Facebook kept his promise. ”I cannot believe this! This is awful! She was a regular customer. A nice girl. Most of the time at least. She could be really rude when she wanted to,” a male voice says right behind me. I turn around to see an old man looking at me. He is dressed in black from head to toe. He looks like the Grim Reaper. As if he read my thoughts he rolls his eyes at me. ”Another glass of white wine please.” I say to the bartender. Seeing the hesitation in his eyes, tears start rolling down my cheeks. It is the first time ever since Linda died that I am able to cry. ”I know I had too much wine already, but please let me have some more. My best friend died a few hours ago.” I tell him. There is not enough wine in the world that can make me forget about what I lost. Linda. My best friend since fourth grade. People used to say we were twins. We looked so much alike. We both loved rock n roll and dry martinis. We both were good at math. We both loved road trips. We both wanted to be singers and we both ended up being accountants. Working at the same firm for years. And within minutes, everything changed. I take another sip of my white wine– Linda loved white wine too-. I flash back to the ambulance coming to get Linda from the restaurant. The police saying Linda was shot between the eyes three times. Shot three times! Why three times? Wasn’t one time enough? I take another sip of wine and I flash back to the woman trying to warn me… I mean trying to warn Linda, on her cell phone. Who the hell was she? The police took Linda’s cell phone and the rest of her personal belongings. They gave everything to Linda’s sister (who was nothing but a real sister to her) and who hates my guts and isn’t going to tell me anything. I glance around the bar and I see a guy staring at me. He is tall, dark, handsome and normally I would throw myself at him but not tonight. Tonight Linda’s ghost is everywhere. The guy approaches my table and asks me if he can sit next to me. I want to say no but I say yes. He smiles at me and sits next to me. He orders two more glasses of wine; one for me, one for him. He tells me he just wants to take my sadness away. I tell him he can’t. He asks me for a chance to try. He tells me he is an artist and that he would like to do my portrait. He tells me he wants to capture the beauty of my soul for everyone to see. I tell him my soul is so ugly right now, full of bitternesss and pain. He tells me there is beauty in bitterness and pain. We drink more wine. I feel so drunk and I don’t know if it because of the wine or because of him. At some point he excuses himself to go to the restroom. He forgets his cell phone on the table. I am tempted to look and after seconds of struggle, I give in to temptation. He has posted something on his Facebook page. A photo of myself with a target on my forehead. 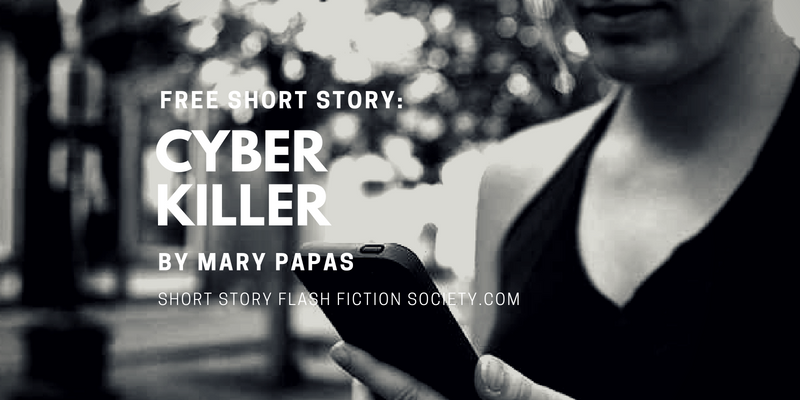 Mary Papas has been in love with the written word ever since she was a kid. Books were always her best friends, sometimes her only friends. She likes to read many books simultaneously while drinking coffee and eating croissants. When she falls deeply in love with a book, she stays up all night to finish it. You can buy her books on Amazon here. This could be a good opening sequence for a thriller/horror film.